Despite our nation's prolonged economic hangover, the Federal government is still begging for labor. Last post, I ranted about proposed legislation that would further liberalize telecommuting rules for Federal employees, purportedly to draw new recruits. Apparently the prospect of not going to work is not enough to attract qualified talent. The Transportation Security Agency, in its continuing quest for talented bag checkers and full body searchers, has stumbled upon a creative way to inspire young candidates about an otherwise unglamorous post. Pizza. Funny, it also works with my very best friend and she's not even looking for a job. A local DC radio reporter "...ordered pizza tonight from a local place, and it came in boxes with ads on them, recruiting for the TSA! 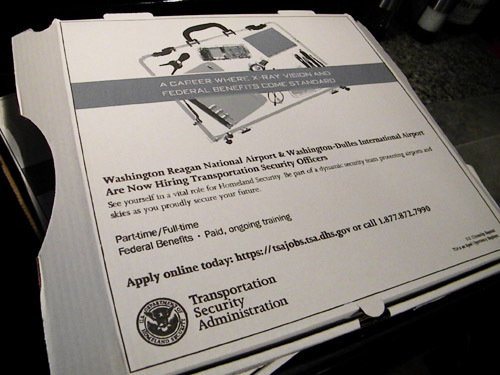 I've never seen a job ad on a pizza box before...and does this mean the TSA is desperate, or just creative?" OK, which is it folks? Creative or desperate? Well, I kinda think I might know. But, then again, do I? Being of a scientific bent, and not wanting to rush to judgement, I decided to do a little experiment to get to the bottom of the TSA desperation/creativity conundrum. Placing my faith in the Internet, as always, I Googled for wisdom and knowledge. Is there evidence in the collective I-conscious for TSA creativity? Likewise, can I prove that a conventional wisdom of desperation prevails at TSA? Let's start with the case for creativity. Federal Reserve - I have a bulletin for those of you who think money grows on trees. It really grows over on 20th St NW at the Federal Reserve, which controls the flow of money into the US economy. They can turn the spigot on and off as they wish. So why not leverage that position to attract a whole new generation of recruits? Why not print up a special round of currency redeemable one year after execution of an employment contract - sort of like options! I now a litigater in New York who would sign in a heartbeat. Department of Commerce - DoC's job is to promote the interests of American business and help to ensure growth in the economy. They've got connections with all kinds of manufacturers and merchants. How about a line of high profile products that can be given out at recruiting events? Add in Hello Kitty and the booth will be mobbed! I'll bet you didn't know that TSA has a mascot. It's a gnome, which gets extra creativity credit, though perhaps a few points taken off the top for impracticality. Gnomes are awful cute and all, but they don't move with grace at public events and they tend to scare the children. On the plus side, unlike the Phillie Phanatic, they are unlikely to draw lawsuits. 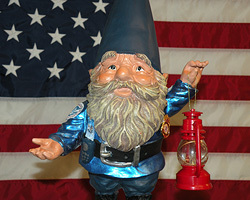 The name of the TSA gnome? Nome. Sigh. Take a few creativity points off. TSA also has an obscure program called the IdeaFactory, which qualifies as marginally creative, though a greater cynic than I might call this a glorified suggestion box. According to WTOP news radio in DC, "TSA has used the IdeaFactory since 2007 as a way for employees to suggest ideas and changes to programs within the agency." The Factory has been so prolific that it was recently expanded to the entire Department of Homeland Security, where ideas have been known to get lost in the maze of agencies that were cobbled together after 9/11 and are only now beginning to find one another's offices. 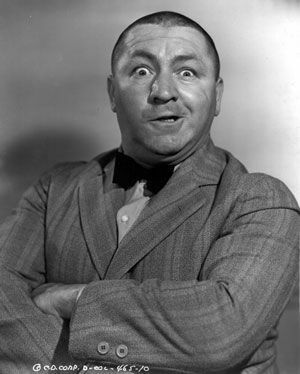 According to WTOP Gale Rossides, Acting Administrator of TSA, said that " . . . one of the best benefits of the Idea Factory, besides encouraging collaboration, has to do with the ease of use." Good thing. WTOP didn't list a single Idea from the Factory that had made it into Production. Now let's turn to evidence of desperation at TSA. Amazingly, after an exhaustive Google search, all I found that remotely qualifies as desperate was the pizza box affair! I suppose it's possible that instances of TSA desperation have become so widespread that they no longer create a ripple in cyberspace, but I suspect not. The agency seems remarkably free of panic. Despite my preconceptions, I am compelled to declare TSA more creative than desperate. What can other Federal agencies learn from TSA's creative spurt?